An oil (turps free) workshop will be held at the Studio on Sat. 25th and Sun. 26th March 2017. A little about the workshop tutor Christine Cafarella-Pearce follows. Members with no experience using oils, as well as more experienced people are encouraged to register. This is a turps free workshop. You don’t even have to have paints if you are an absolute beginner or have never tried oils, as some materials will be available. Come along and give it a go! If you’re interested, please download the enrolment form – click here – and get it in as soon as possible, as places are limited. Christine began her career as a portrait and still life artist. 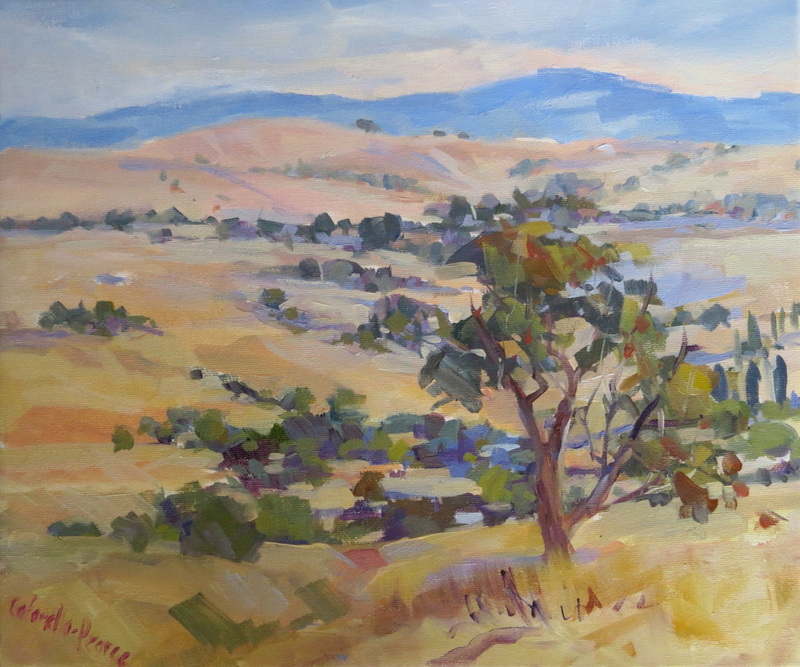 She is also a keen outdoor painter, travelling and painting widely in Victoria and remote Australia. She lives in Healesville and her paintings of the Yarra Valley show her affinity and love for her local landscape, whilst her paintings of the Pilbara and Kimberley regions and far North Queensland speak of her great love of the outback. Christine is known for her unique colour and design which enables her to interpret mood more effectively and bring added meaning to her subject. She draws from The Heidelberg School and the French Impressionist Painters in her effort to exploring and integrates more creative ways to tell her stories. Christine has hosted many exhibitions, including the 2014 Liberty Family Church, Healesville 40 hour Famine Fundraiser Exhibition (15 charcoal works, 13 of which were portraits) and the 2013 “A Joint Perspective”, a collaboration of works by Christine, Di King and Raelene Sharp. Her works can be found in private and corporate art collections throughout the world. Christine has been published in The Australian Artist, Antiques and Art, Real Estate Weekly and Yarra Valley Country Life. A Fellow of the Australian Guild of Realist Artists, she is well respected as an art judge, workshop tutor and demonstrator and is a valued member of AGRA, Sherbrooke Art Society, Yarra Valley Open Studios Program and Valley 10.